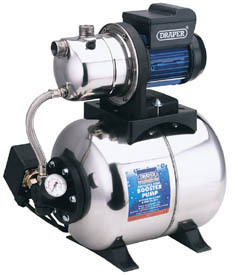 Stainless steel bodied pump ideal for maintenance of home and garden water supplies. 24L expansion tank holds water to keep constant water pressure, automatic cut-off switch ensures continuity of water pressure and prevents pump from running dry. Non-return valve and long life double insulated impeller. Display carton. Output size ... 1" (25mm) dia.